New Zealand's Prime Minister Jacinda Ardern proves there is another, more refreshing approach to political communication that puts leaders of this country to shame. In an era of populism, identity politics, division and elected leaders placing the interests of their own parties and career ambitions ahead of their constituencies, consider these simple words: "They are us, the person who perpetuated the violence against us, is not". Has there ever been a more poignant response in the wake of a terrorist attack? New Zealand Prime Minister Jacinda Ardern, at only 38 years of age, has displayed the leadership, humanity and conviction that is sorely lacking from much more seasoned politicians in this country and abroad. Ardern’s response to New Zealand’s darkest hour – the Christchurch attack, where 50 muslims were gunned down by a right-wing terrorist – will be remembered for its authenticity, empathy, decisiveness and for what she chose not to say. By refusing to play the populist card of ‘good’ versus ‘evil’ that usually follows such horrendous tragedies, and by refusing to name the individual involved – a gesture PRWeek will honour – she has taken control of an unprecedented national crisis, refused to give a terrorist the platform and outcome he desired, and propagated a message of love and unity, when so often such events stir division. She also banned military-style, semi-automatic assault weapons in a matter of days following the attack – a move that would never happen in the US, despite its far more frequent mass shootings. The muslim call to prayer was broadcast across the country and the PM pulled out all the stops to show the vicitims of this tragedy that she – and the nation – are by their side. It wasn’t just her words. 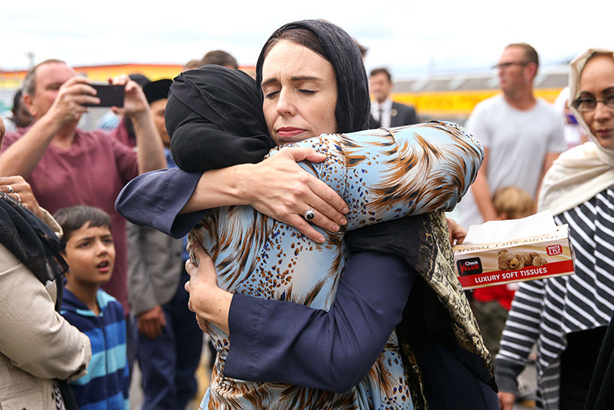 The iconic Ardern image from this tragedy is when she wore a hijab in solidarity as she mourned with those affected. It is hard to imagine Theresa May or other political leaders pulling off such a simple, heartfelt and moving gesture in an authentic way. Powerful communication isn’t just about punchy, poignant, scripted speeches that rally the nation – it’s also about body language and how you relate to your audience. Ardern – who is largely adored by her country – proves that a gentle, caring and authentic tone can be far more powerful than the shouty soundbites, mud-slinging, misinformation and populist tweets that have come to characterise the political rhetoric of her peers abroad.